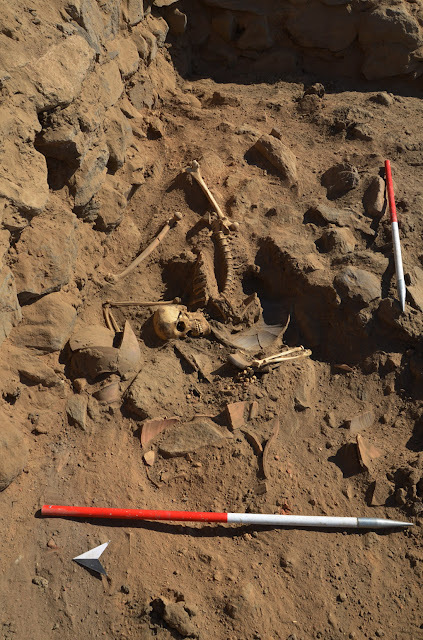 Dr. Ahmed Essa, the newly appointed Minister of State for Antiquities, announced the discovery of a skeleton of a young soldier in a late Roman site of Hisn Al-Bab to the south of Aswan. Dr. Essa said that the discovered skeleton in a good condition and the preliminary study of the bones refers that he served in the military for a long time and died at the age of 25 to 35 years old. The skeleton’s identity was not identified but probably it belongs to an Egyptian soldier from Nubian origins. Adel Hussein, Director of the Ancient Egyptian Antiquities department, said that the cause of death was a knife-like stab at the groin which led to cutting the vein then the body was buried immediately after death under the fortress remains. Mr. Hussein added that the mission couldn’t determine the time of the outbreak of this particular conflict, which still needs further studies, but preliminary evidence suggests it occurred shortly after the Arab conquest of Egypt. Dr. Irene Forstner-Müller, Director of the Austrian Archaeological Institute mission, said that the mission also discovered a kitchen with a large number of broken potteries used to preserve huge quantity of olives in them and remains of plants. This very well-preserved stone and mud brick fortress lies between the High and the Low Dams at Aswan in Upper Egypt, and close to the abandoned village of al Bab, on the east bank of the Nile at the southern end of the first cataract. In modern times, its existence was noted in passing during the first Nubian archaeological survey, but was dismissed as ›Arab‹. Little more attention was paid to it during the archaeological survey of 1928–1934. At that time, Monneret de Villard noted the existence of the fortress in his survey of medieval monuments of Nubia, and suggested that Hisn al-Bab was to be identified with a fortress well-known from medieval Arab historians, al-Qasr. Al-Qasr was regularly described as lying on the east bank just south of Philae and four or five miles south of Aswan, and it was said to mark the beginning of Nubian territory. This location fits that of Hisn al-Bab accurately, and it is probable that its identification as al-Qasr is correct. From the Arab historians, it is known that al-Qasr was the delivery point of goods stipulated by the ›baqt‹, an understanding between Egypt and Nubia made shortly after the Arab conquest of Egypt, in ca. 651–652 A.D. It stipulated that peaceful relations would be maintained between the two powers provided that the Nubians provided various items, including a yearly consignment of slaves, and also fulfilled other obligations. The ›baqt‹ remained in operation, if somewhat sporadically honoured, for at least 600 years. Despite al-Qasr’s status as the first point within Nubian territory, the fortress housed a Fatimid garrison at one time, and may perhaps have been the base for the Fatimid official in charge of border control. Further, the mosques immediately to the south of the fortress were said by certain authors to have been under Egyptian control, although the church on top of which one of them was built was said specifically to be under Nubian authority. This complicated state of affairs may imply the existence of some sort of no-man’s land between Egypt and Nubia proper. References to al-Qasr disappear from textual sources by the end of the Fatimid period. The fortress of Hisn al-Bab/al-Qasr was assumed by recent commentators to have been lost to flooding after the construction of the High Dam. In fact, its situation on the steep hillside between the High and Low Dams has meant that most of the fortress survived flooding, and it is in a good state of preservation, with mud brick and stone walls standing over 8 m tall in some areas. Two separate phases were identified at Hisn al-Bab. The identification of an earlier, Late Roman, fortress of the 6th-7th century was unexpected. This fortress included a large enclosure on the gebel top, walls running down the slope to the river under the later fortress, and areas of what appear to be habitation within the walls. The later fortress, presumably that of al-Qasr, and thus well known from texts, was very well preserved architecturally but surprisingly left almost no other material remains on the surface.